When hard-to-kill chewing and sucking insects invade your garden, pyrethrin-based sprays come to the rescue. Pyrethrins are the active ingredients in pyrethrum, a powder made from ground flowers. A potent insecticide used for at least 2,000 years, pyrethrum is among the strongest pesticides allowed under U.S. organic standards. For your homemade pyrethrin spray, start with growing the flower. Two daisy species deliver pyrethrins at levels needed for effective sprays. Dalmatian daisies (Chrysanthemum cinerariaefolium) have the highest pyrethrin potency. Sometimes called pyrethrum daisies, these perennials can be grown from seed, transplants or divisions. Many companies offer seed, and more nurseries are following suit with plants as pyrethrum popularity grows. Don't let botanical names confuse you. You may see this plant listed under the genus Chrysanthemum, Pyrethrum or Tanacetum. Painted daisies (Chrysanthemum coccineum) offer less potent pyrethrin levels, but can produce effective sprays. Some other daisies contain pyrethrins, but at lower, ineffective levels. Dalmatian daisies beautify gardens while pyrethrins build. Their stiff stems hold yellow-centered, aromatic white flowers among silvery, blue-green leaves. Thriving in U.S. Department of Agriculture plant hardiness zones 4 through 10, they are nearly pest-free. Hardy in USDA zones 3 through 7, painted daisies boast white, pink and red blooms atop ferny foliage. 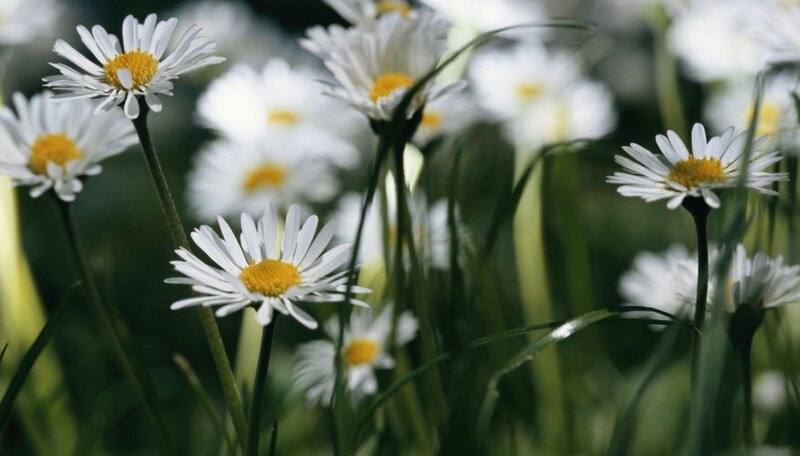 Both daisies prefer full sun, which significantly increases pyrethrins. Keep weed competition down. Rich, loamy soil leads to plentiful flowers, but porous, semi-arid, alkaline soil produces the highest pyrethrins. High-altitude gardeners enjoy increased pyrethrin concentrations. For maximum pyrethrin levels, harvest fully opened daisies during dry, warm periods. Commercial growers target blooms between the fifth and ninth day after flowering begins. Large central daisies carry more pyrethrin than outer blooms. A healthy plant can yield up to 100 flowers. Cut the flowers, stems and all, then place them head first in water for 24 to 48 hours. This intensifies pyrethrin levels. Then dry the flowers in the sun, on racks or hang them in an area with good air circulation. Dry leaves until they're about one-fourth to one-third the original weight. At room temperature, freshly harvested flowers keep about 10 days in an airtight container. Dried flowers kept in airtight containers keep several months. Keep containers away from light. Crush dried flowers using a mortar and pestle, or other grinder. The finer the grind, the higher the potency, but the faster pyrethrins deteriorate. Light, heat, air and alkalinity speed the process, too. Use water to draw pyrethrins out. Soak 1/2 tablespoon dried, crushed daisies in 1/2 gallon of water for three hours. Fresh flowers work, but take three to four times as many blooms. Place the extract solution in a sprayer. Strain out large particles, if necessary, to prevent clogging. Add 1 tablespoon dishwashing soap, if desired, to help cover leaves better and increase effectiveness. Spray pests directly, and spray leaves thoroughly. Pyrethrum comes from flowers, but this potent pesticide paralyzes insects on contact. The National Pesticide Information Center advises that pyrethrum sprays do not discriminate between pests and beneficial insects, such as honey bees and lady beetles. It also can harm aquatic life. Without rain, the spray stays effective 12 to 48 hours before degrading. Both the powder and spray may cause dermatitis and other allergic reactions. Wear gloves, protective clothing and goggles when working with the spray. If shopping for pyrethrin-based products, beware of similar-sounding names. Pyrethroids are synthetic, man-made chemicals that mimic the pyrethrum's makeup. They are much more toxic and do not degrade as quickly.